RFID to combat chronic pain? Dallas-headquartered startup MicroTransponder is working to develop a RFID-based implant to use in the treatment of chronic pain. The device, roughly the size of a grain of rice, would provide a wireless alternative to larger spinal-cord stimulators currently being used for the same purpose. Both the potential RFID implant and the current stimulators work on the same principle; an electrical pulse delivered by the device overrides neural pain signals sent to the spinal cord. 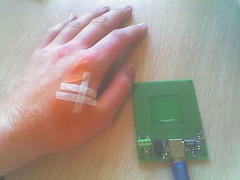 Devices currently on the market require a battery and controller to be implanted under the skin, with a set of connected leads delivering the pulses. MicroTransponder’s proposed implant would have no internal battery. Instead, an external battery-powered coil worn on the patient’s arm or leg would create the radio frequency transmissions which would power the implant’s electrodes. The system would be controlled by a laptop or PDA. The system is currently being tested on rats. If the tests prove successful, researchers believe the implants could be used for a range of conditions, from chronic pain to tinnitus. Other researchers say previous attempts at similar devices has proved unsuccessful, and are skeptical that sufficient stimulation can be generated by this type of system. A MicroTransponder spokesperson says the firm is optimistic that its proprietary technology will be more successful.